Ever wonder what happened to Dorothy and the Oz gang after she returned to Kansas? Well, wonder no more. Baby Gumm Productions presents Darren Stewart-Jones’ Emerald City – A musical play (based on the beloved Wizard of Oz characters by L. Frank Baum) at the Tarragon Main Space as part of the Toronto Fringe Festival. As our story opens, life is not so much fun for Dorothy (Christie Stewart), Scarecrow (Christopher Vergara), Tin Man (Matthew Fuller) and Lion (Dillan Chiblow), as each struggles with his/her life problems. And Glinda (Rory Bray), once Dot’s BFF, is too busy with her new career as a super model to spend time with her friend. As the show progresses, we follow Dorothy and her trio of intrepid Oz pals through a group therapy session with the invisible Dr. Oz, as – through song and dance – their troubles and secrets are revealed. This is a lovely cast with an impressive set of pipes. Stewart’s Dorothy is a go-getter, full of gumption and hope, and pondering her situation as a modern-day single gal. Vergara brings a wonderfully endearing presence and physically to Scarecrow; Fuller’s Tin Man is sharply handsome and warmly supportive, struggling with staying real and logical, but finding it difficult to mask a broken heart; and Chiblow is adorably anxious as Lion, sweet and cuddly in a leopard print onesie. And Bray nails material girl Glinda, delivering her vocals with the trademark vibrato. With shouts to music director Nicole Byblow, choreographer Allison Beula and designer Henry Keeler’s fabulous modern-day costumes. Emerald City is a funny, charming ‘what if’ tale of Dorothy and her Oz friends. 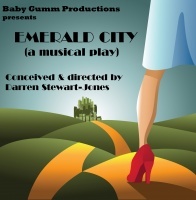 Running until July 13 at the Tarragon Main Space, you can check for exact dates/times for Emerald City here. Darren Stewart-Jones’ Emerald City at the Toronto Fringe.